Whether you're decorating for an office holiday party, sprucing up your tiny apartment, or contributing something new to the family Christmas tree, these 5 adorable recycled paper ornaments are sure to make the season bright. All you'll need are a few easy-to-source materials, including paper right from your recycling bin. Follow along with our 5 simple tutorials and create your own seasonal ornaments in no time. 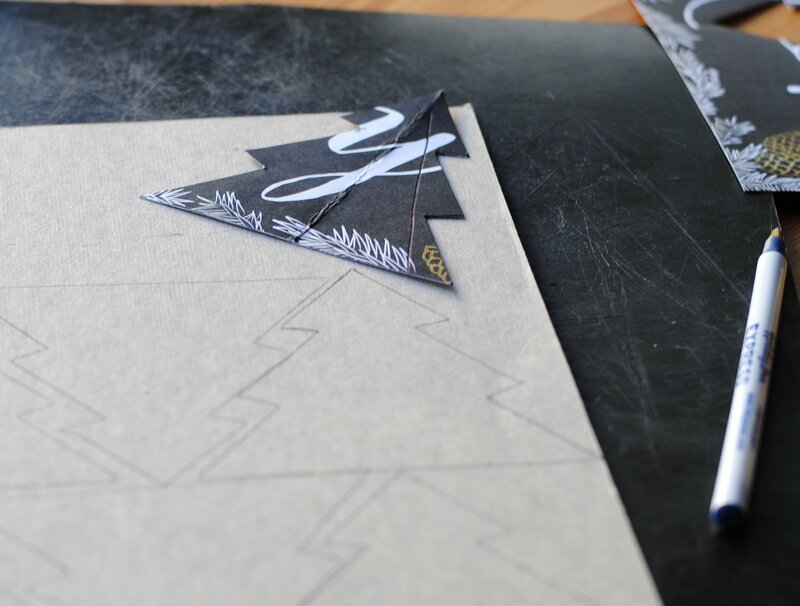 First create a template Christmas tree shape (it should be symmetrical) on a piece of cardboard or cardstock. Cut it out and then trace the template onto a piece of recycled cardboard. You’ll need two Christmas tree cutouts for each tree ornament. Once the trees are cut out of cardboard, you can start to decorate them. Using a paintbrush, daub Mod Podge (or regular white glue) on each cutout. We sprinkled half of them with glitter, and pasted on shreds of old maps and stationery onto the other half. 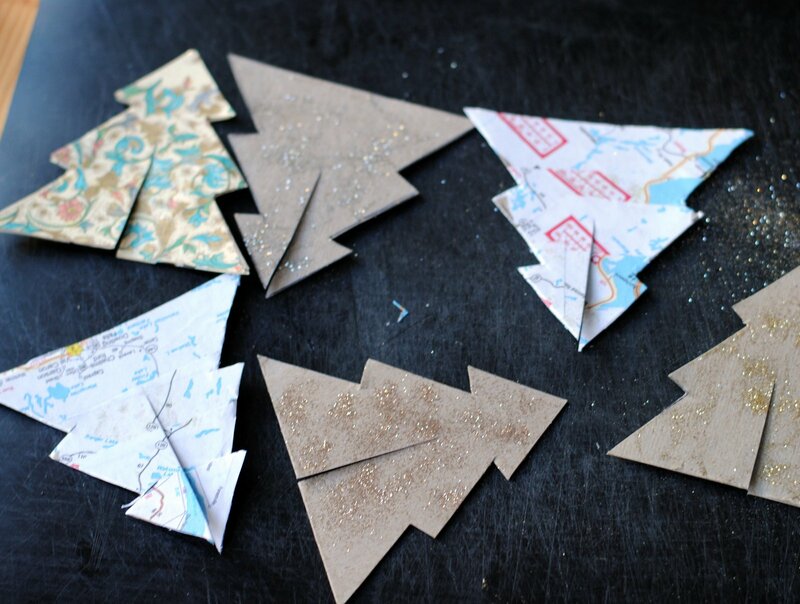 If you’re using recycled paper for a decoration, make sure you use another coat of Mod Podge on top to seal it on. 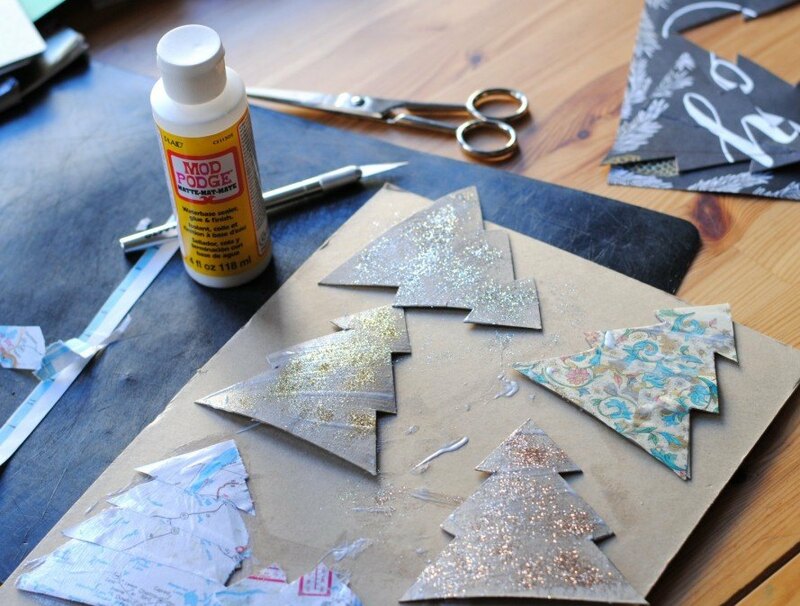 Once they dry (about 10-15 minutes), flip the trees over and apply the desired collage or glitter to the other side and dry thoroughly. Get ready to assemble your trees: using scissors or a utility knife, carefully slice a slit into each tree – for each pair of tree cutouts, you’ll need to slice once through the bottom up of one tree, then once from the top down of the second tree so they slot together like puzzle pieces. We used one glitter cutout and one decoupage cutout for each ornament – carefully slide one cutout onto the other, arranging the slits so that the shapes lock together. You can stand the tree ornaments on their own on a mantelpiece or counter, or using a needle and thread, add a hanger, dangle from a Christmas tree or houseplant, and admire. 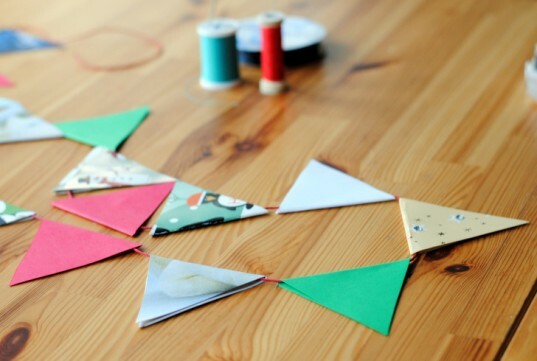 Create a whimsical, colorful bunting garland to deck your Christmas tree, mantle, or doorway this season. All you’ll need is a handful of Christmas cards to make your decor bright. Follow along with the whole tutorial here. 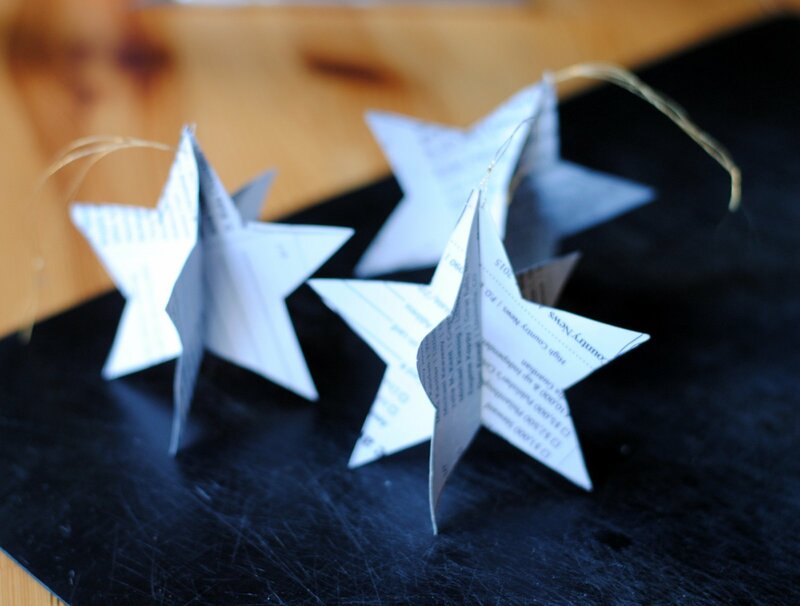 These simple, whimsical stars will brighten your space for the holidays. First, determine the thickness of your paper. If you’re using a catalog or old book, the paper may be thick enough to stand on its own. If the paper seems flimsy, use a glue stick to glue two sheets together and let dry before proceeding. Trace a template of a star onto a piece of old cardstock and cut out. 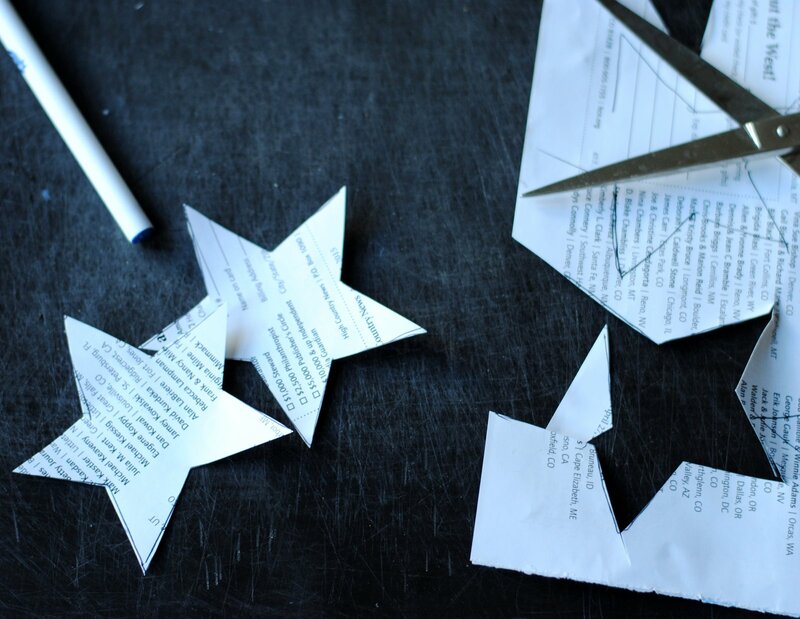 Using a pen or pencil, trace the star shape onto the newsprint. You’ll need two cutouts for each star, so ensure you cut out an even number. 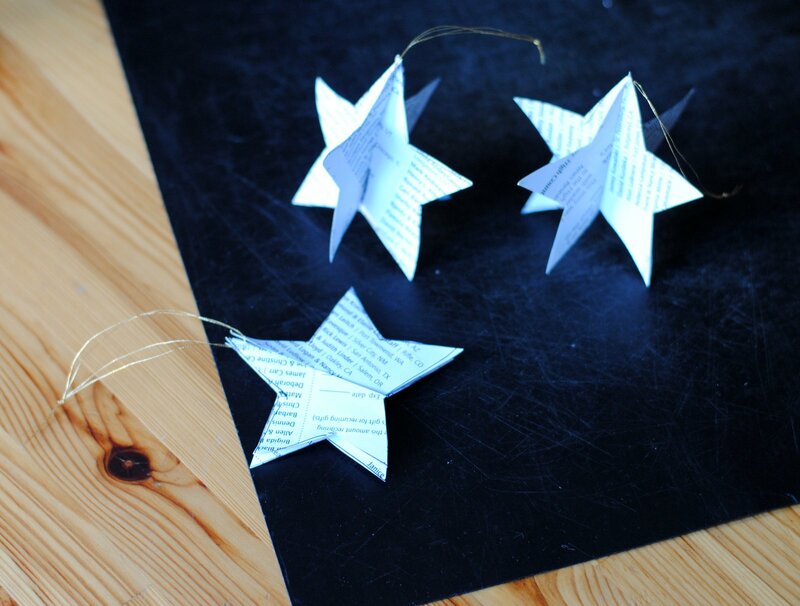 Cut a slit into the top of half the stars, and the bottom of the other half of your star cutouts. Fit the two pieces together, then using a needle and thread, create a thread hanger. Red and gold thread look especially nice with the newsprint. These colorful, rainbow-hued feathers flutter with even the slightest wind. They’ll add a bohemian touch to your Christmas tree, holiday table, or even as part of gift wrapping. You’ll wash translucent, colorful, watercolors over recycled magazines or newsprint. Check out the tutorial here. What a fun project for all ages. Create an amazing table-top Christmas village, complete with houses, towers, churches, and evergreen trees. All you’ll need to do is save some of the packaging from all those holiday deliveries. Follow along with our easy tutorial here. All photographs by Emily Peckenham for Inhabitat. Decorate your space this year with adorable handcrafted ornaments created from recycled materials. 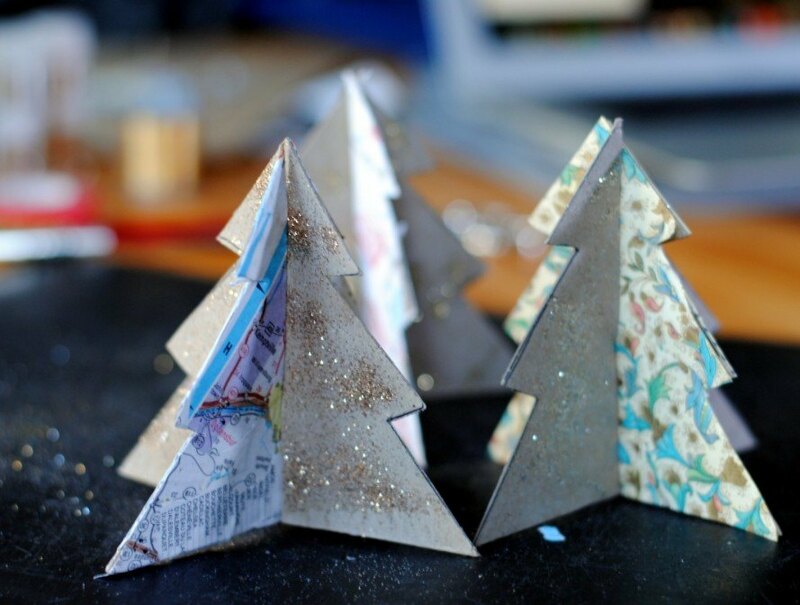 First create a template Christmas tree shape (it should be symmetrical) on a piece of cardboard or cardstock. Cut it out and then trace the template onto a piece of recycled cardboard. You'll need two Christmas tree cutouts for each tree ornament. Get ready to assemble your trees: using scissors or a utility knife, carefully slice a slit into each tree - for each pair of tree cutouts, you'll need to slice once through the bottom up of one tree, then once from the top down of the second tree so they slot together like puzzle pieces. We used one glitter cutout and one decoupage cutout for each ornament - carefully slide one cutout onto the other, arranging the slits so that the shapes lock together. You can stand the tree ornaments on their own on a mantelpiece or counter, or using a needle and thread, add a hanger, dangle from a Christmas tree or houseplant, and admire. Glitter collage the christmas trees. Last year's Christmas cards, scrap paper, and junk mail Scissors Thread Needle Glue or double-sided tape Create a festive, colorful bunting garland to deck your Christmas tree, mantle, or doorway this season. All you'll need is a handful of Christmas cards to make your decor bright. Follow along with the whole tutorial here. Trace a template of a star onto a piece of old cardstock and cut out. 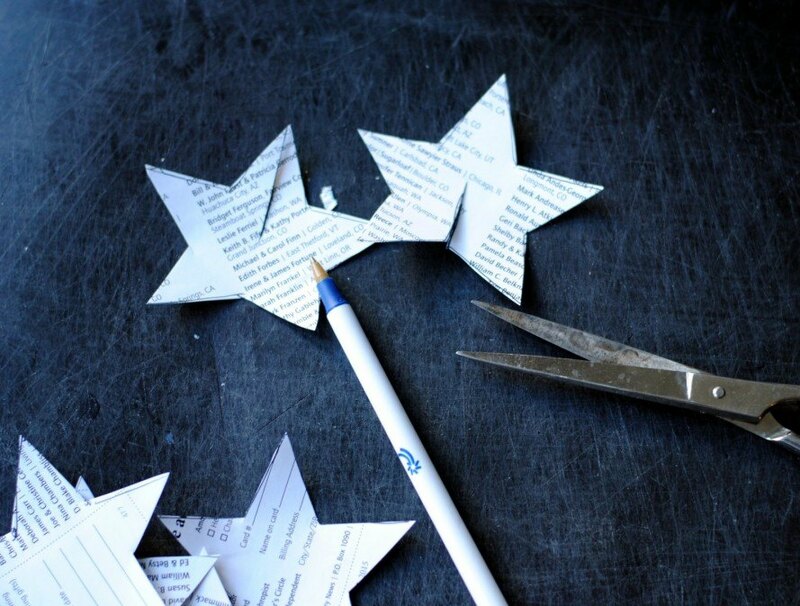 Using a pen or pencil, trace the star shape onto the newsprint. You'll need two cutouts for each star, so ensure you cut out an even number. Cut a slit into the top of half the stars, and the bottom of the other half of your star cutouts. Fit the two pieces together, then using a needle and thread, create a thread hanger. Red and gold thread look especially nice with the newsprint. 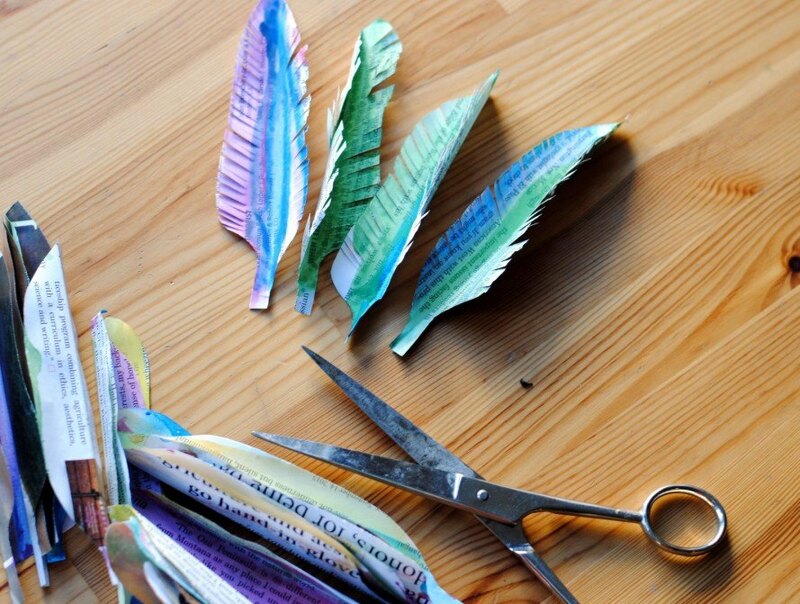 Newsprint, magazines, or old book pages Watercolors Water and paintbrush Washi or masking tape Fishing line or string Scissors These colorful, rainbow-hued feathers flutter with even the slightest wind. They'll add a bohemian touch to your Christmas tree, holiday table, or even as part of gift wrapping. You'll wash translucent, colorful, watercolors over recycled magazines or newsprint. Check out the tutorial here. Recycled cardboard boxes Scissors Craft knife Ruler Pencil White paint What a fun project for all ages. 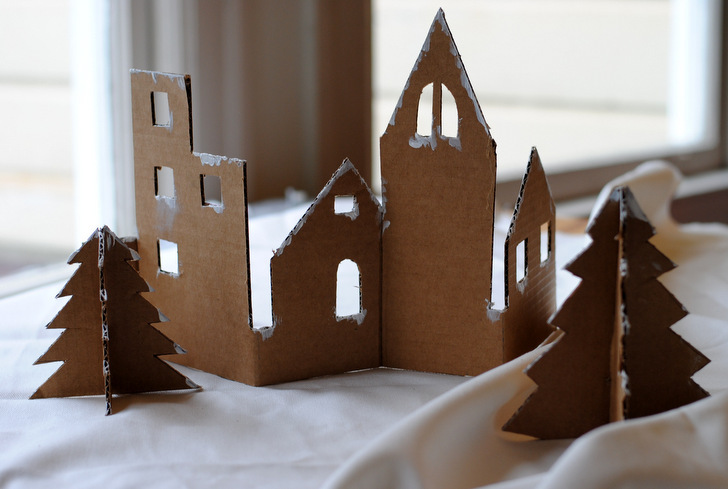 Create an amazing table-top Christmas village, complete with houses, towers, churches, and evergreen trees. All you'll need to do is save some of the packaging from all those holiday deliveries. Follow along with our easy tutorial here.